How to Fix iPhone won’t charge Problem? Should I buy iPhone Xr? What is Apple Liquid Retina Display? Liquid Cooling System in Mobiles: How this Technology Works? On 29 August 2016, Intex launched new IT Turbo SUF Bluetooth speakers to expand its 2.1 channel speakers’ range. It is an affordable sound system that comes with USB port, SD card slot, and built-in FM tuner. With this launch, Now Intex has 25 models in 2.1 series, 10 models in 5.1 series and 15 models in 4.1 series. As I have found on the Intex’s official website, the company has 6 models of the Bluetooth Speakers (excluding IT Turbo SUF) in the market. 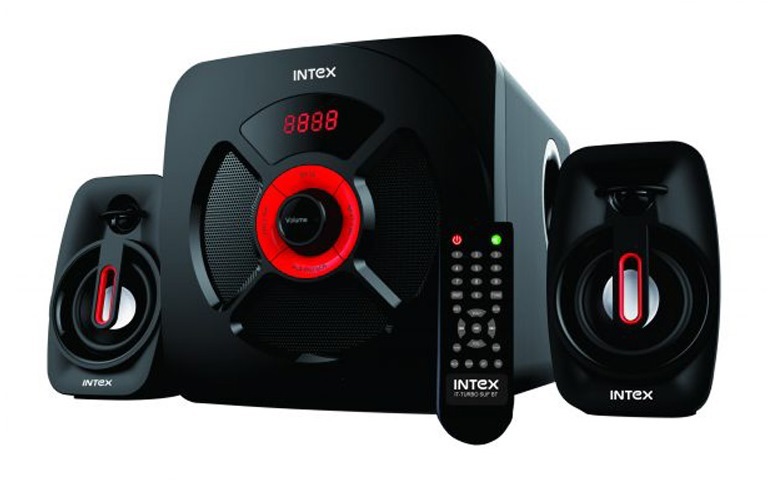 The new Intex Bluetooth speaker named IT-Turbo SUF supports a USB 3.0 port, SD card slot, built-in FM tuner and Bluetooth connectivity for the wireless experience. The 2.1 channel speaker comes with LED display and AUX Audio input compatible with DVD player, PC (Desktop/Laptop), and LCD TV. This speaker is operated via single tiny LED display that gives consumers an ultimate experience of digital FM. IT Turbo SUF Bluetooth speakers are equipped with 40W + 10W X 2 output power for delivering a very high performance of the audio. Speakers can be easily controlled via full function remote control. The main units are compact and light weight, making the speakers ideal for home or office use. The size of the main unit is 13.34cm & the satellite is 7.62cm. The system weighs 4.3kg. The frequency response of the main unit is between 40Hz – 200Hz and the satellite response is between 200Hz – 20KHz. This sound system has Bluetooth range of up to 7 to 10 meters. IT Turbo SUF BT sound system is available in only Black color option. It will be available in the market at the price tag of INR 4,000 only. You can buy this Bluetooth sound system from the online or via the offline stores at the price tag INR 4K. Hi, I am Dhruv Sharma founder of gadgetsloud.com. I am a learner, an explorer and also good food lover. I like to blog since 2010. I am working as an engineer in a normal IT based company (scary job). I love to code and blog all the time. I am a web developer and also SEO learner. I learned many great stuff about blogging and SEO and believe me this blogging stuff is all time great thing that I did ever. How to Enable or Disable Auto Call Answering feature on Android? What is Hybrid Dual SIM Slot (New Feature) in Smartphones?